Andrew graduated in 1988 from the University of Sheffield Dental School and initially worked at hospitals in and around Sheffield and Cardiff where he gained a wealth of experience in oral surgery and a lasting interest in orthodontics. He joined the practice in 1992 and shortly afterwards became co-principle. Whilst at the practice, Andrew has been a vocational trainer helping newly qualified dentists in their first year of dental practice. 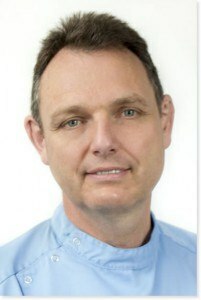 Recently he has returned to working at the Charles Clifford Dental Hospital as a clinical tutor supervising dental students at Sheffield University. He enjoys and practices all aspects of general dentistry at Diamond Court. Andrew is married to a GP, he has two daughters and lives in Sheffield. He enjoys being outdoors when not at work, especially in the Peak District. He is trying to master the art of golf with limited success so is also trying to keep fit playing racket ball.